-8- lost!" "Remember me: - The stranger you found that day in Tipton, before the Judge, so worn, Stood the stranger bent and torn: a looking up into the Judge's face, To see if mercy could I trace. And then sentence passed was death. And I to find the Lord in faith, With the teachers of God's mercy so divine, O wonderful Lord, the judgment thine. John Mercer." 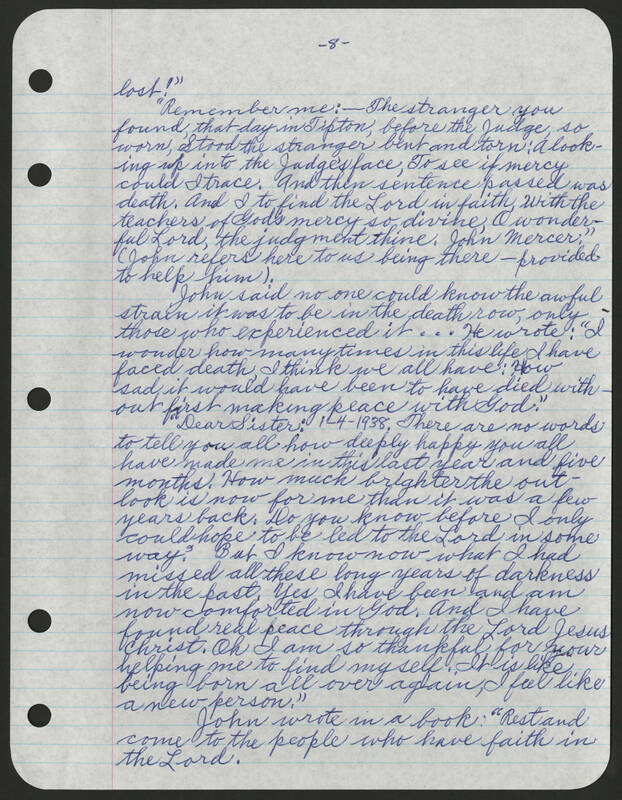 (John refers here to us being there - provided to help him): John said no one could know the awful strain it was to be in the death row, only those who experienced it...He wrote: "I wonder how many times in this life I have faced death, I think we all have: How sad it would have been to have died without first making peace with God." "Dear Sister: 1-4-1938. There are no words to tell you all how deeply happy you all have made me in this last year and five months. How much brighter the outlook is now for me than it was a few years back. Do you know before I only could hope to be led to the Lord in some way." But I know now what I had missed all these long years of darkness in the past. Yes I have been and am now comforted in God. And I have found real peace through the Lord Jesus Christ. Oh I am so thankful for your helping me to find myself. It is like being born all over again, I feel like a new person." John wrote in a book: "Rest and come to the people who have faith in the Lord.